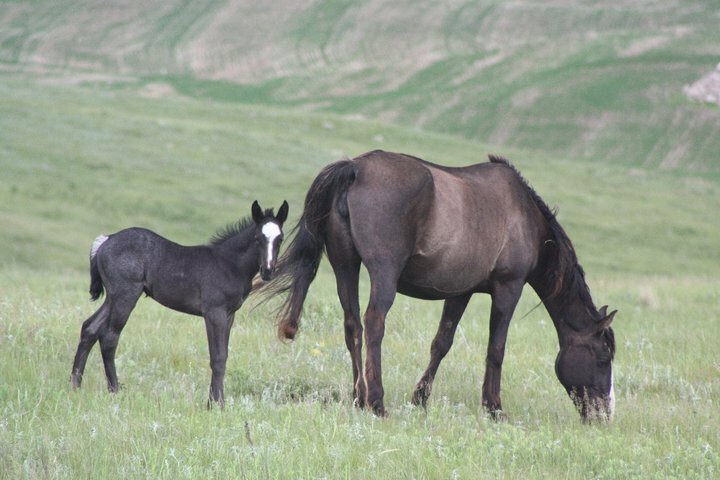 Wild Prairie Rose as a filly in ND summer 2011 with her mother Lucky Dust. Hi folks! Decided to make a separate blog post about the good response we got on the last post about essential minerals for horses. I totally agree with you Seth,”weeds” probably are an underestimated asset as you brought me to ponder about it (poisonous weeds excluded). Weeds often have deep roots that reach down to where most minerals can be found, since minerals have high density they tend to wander down in the soil by time. Weeds may be low in proteins and energy and they compete with planted grasses and are therefore “hunted”; haven’t found any research about the “weeds”, but since their roots often go deep it can be suspected they are an important mineral reserve. Proteins and energy is easier to compensate for than low mineral content, so I say let the weeds live. When we broke our (formerly bull) pasture it had been used only by moose and roe deer for over 20 years; we just fenced it, nothing else. It is indeed rich in a variety of weed plants but also the strongest of the original planted grasses like English Rye. Besides the Nokotas also have the Alder trees to chew on. During winter the Nokotas ate twice as much salt blocks and mineral blocks compared to in the summer! I have read that a high PH enhances the mineral content in forage compared to a low PH. That would mean there should be higher mineral levels in Skåne and Gotland, southern Sweden. Don’t know if that is thoroughly checked. As you know, high PH traditionally means that fertilizers high in phosphorus and potassium (kalium) works better, so maybe that is what they mean by “enhanced mineral content”. Tampering with the soil is problematic since human knowledge tends to be more modest than we like to believe. Regular horse dung and grasses have been living in symbiosis for millions of years; manmade fertilizers can’t compete with that ;). This means they perfectly supplied themselves with the missing minerals Na and Cl. About the mineral blocks, our horses do not like it that much. We use the Horse-block from Granngården and they consume only maybe 10 kg in 4 months, meaning 92 mg/kg bw. Mg: No supplement is usually needed but since it increases the absorption of calcium it is good for growing horses, though the content in the blocks seems negligible. Cu: A good mineral to supplement for young horses, the Vilt block covers full RDI. Zn: Negligible levels in both blocks. Mn, Fe: Unnecessary to supplement, negligible levels in the blocks. Co: Not usually necessary to supplement, Vilt seems a little high. Se: Usually very good to supplement, the Vilt is full RDI, Häst is a little low. This entry was posted in Horse feeding and tagged Equine, feeding horses, Hästar, Horses, photography. Bookmark the permalink. You have done so much work here in the interest of sharing, which is great, so now i feel like i should add some more detail, too 😉 In North Dakota, Yellow Sweetclover (Melilotus officinalis) is a heavily utilized “weed” and actually often one of the first plants consumed when turned into fresh pastures in early June, possibly for its rich protein at this rapid stage of growth. But early in the season i also see the horses consume, albeit very selectively and only in small quantities but also long before the grasses are depleted, Astragalus species, although i must confess i can not recall at the moment which. But again these are legumes, although many are also Selenium concentrators in an already Selenium rich area…. Turning to Sweden, our horses here absolutely relish tistle (Cirsium species and naturally the less prickly the better although they seek out the flowers of all and tolerate an amazing amount of spines on the leaves and even stalks), älgört (Filipendula ulmaria) after midsummer, gulvial (Lathyrus pratensis), vicker (Vicia species), Hallon (Rubus idaeus) in the middle to later part of the summer, and even surprisingly seek out a bit of fracken (Equisetum species) to blend in with their diet… more thoughts soon and thank you much! I can tell you we have thistles (Cirsium) in our pasture too, especially a species with relatively big leaves and not extremely prickly, have seen them eat some of those leaves. When the drought came and the horses had eaten most of the grass the thistles and the nettles were prominent, so we cut them down once to give the grass a temporary advantage. Gulvial (Lathyrus pratensis) is also plentiful here, the horses eat some of it, but it seems they are not the first-hand-choice. In the south part of the pasture there were a lot of Skogsfräken (Equisetum sylvaticum) in the shadows, which we tried to reduce before we opened the pasture in May, can’t say I’ve seen them eat any. Under the trees there are a little ormbunke (Pteridophyta) which at least Rosie has tasted. Otherwise it’s the sweet English Rye that is one of their favourites. Interesting! The sheep have helped this year, but even last year when it was just the horses in the main pasture around the house they totally depleted the Lathyrus pratensis (although it was relatively uncommon here, but in the west äng they also preferred it) and nearly eradicated the Cirsium species… both of which i pick along the road and elsewhere and give as “treats” sometimes 😉 This year i don’t think i can find either on any of our fields thanks to both Nokotas and sheep… but i did recently notice that our young studs were not as crazy for the Vicia as the mares so i suspect part of these differences in preferences may have to do with lactation… some with soils and climate… much, much more to learn as always! Hello, Any thoughts on Kelp? Hi Meg! Kelp, like other seaweeds, is a very powerful Iodine source…may contain up to 1000 times more Iodine than any other feed…so it is a practical ingredient when producing mineral supplements…but since it can only be used in very very small amounts it probably has no other effect than just as an Iodine source. And Iodine is most often enough provided through regular hay. Thank you for your reply. I had been feeding my three horses free-choice kelp from one source (www.noamkelp.com) and they seemed to really go at it, a cup or so a day I think. So I decided to try another brand, Thorvin kelp, and now they will not touch it, they wont even smell it. I have read (I thought) thoroughly about both, and they appear to be similar kinds of kelp, produced in a very similar manner, and both are used in animal feeds. But no one can seem to tell me why my horses will eat one and not the other. The Thorvin does appear to be higher in Iodine than the other brand, could it be that they dont want (or need) the higher iodine? Maybe for the reason you mentioned? I took a quick look and it seems both brands use a kelp called Ascophyllum nodosum or Norvegian kelp, but Thorvin also mix it with Laminaria digitata or Oarweed. Maybe its the Oarweed they don’t like, or some other small ingredient that smells different. horses can be choosy as you know since they have such good sense of smell and taste. It would not surprise me if horses can sense if some mineral is needed or if it is enough, as our mineral stones are consumed differently depending on season. As you know mineral balances are complicated.